Access to two stand-alone personal umbrella markets: RLI (preferred) and Anderson & Murison (alternative). Protect yourself from "failure to offer" E&O claims; offer a personal umbrella to every client. Retailers are seeing their fair share of disruption. Lines are blurring between traditional brick-and-mortar and brick-and-click stores. Consumer shopping behaviors evolved slowly in the past but now are changing at warp speed. While in-store retail still accounts for 90% of all retail sales, online sales doubled in the past ten years and should continue to grow. What's missing from those stats is that nearly half of in-store sales are preceded by an online search. Easier-to-use mobile apps will also accelerate online sales. All this rapidly changing and expanding technology comes with risks and every digital transaction could be hiding a potential cyber-attack. Counter these and other risks your retail clients face with Big "I" Markets partner Travelers. 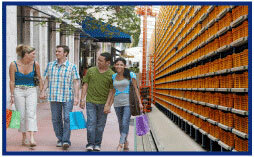 The Travelers Master PacSM Business Owners Policy for retailers combines property insurance - to cover damage to buildings, contents and personal property - with liability insurance to protect you if someone threatens to sue. Master Pac protects the things that matter to your clients. Off-premises or in-transit goods, including shipments to customers; unlike most of competitors, Travelers covers up to the Business Personal Property (BPP) limit - without sublimits. Theft, robbery or vandalism and theft damage to rented property - up to the BPP limit for better-than-average protection. Tenant improvements to rented property. Automatic 25% increase in BPP limit to cover seasonal fluctuations. Covers damages paid in judgments or settlements, and legal defense costs, if insured is sued or held liable for accidental bodily injury or property damage. Protects businesses if a product it sells causes bodily injury or property damage. Includes protection against liability for publication of defamatory material or copyright infringement in advertisements. Protects businesses if patrons are injured on premises - such as slips, trips and falls. Insures can protect their revenue stream and get back up and running if a covered loss strikes its store, warehouse or a major supplier. Bonus: Losses caused by electronic vandalism (computer attack, virus, malware) are covered up to $25,000. Covers theft of money, property or inventory. This is critical for retailers, yet many insurers don't automatically include it in a standard BOP. Travelers does. Covers loss or damage to computers, register systems, software and data - including point-of-sale systems, inventory management applications, electronic customer records and physical losses related to digital disruptions. Master Pac also has a variety of endorsements that can be added as needed. With so many electronic transactions, both online and at point of sale, your clients have a lot at stake. When a system is hacked or compromised, they risk costly chargebacks, or reputational damage and loss of sales. Cyber criminals are always looking for a weak spot (like maybe an outdated e-commerce feature on your website). In fact, almost half of all retailers consider cyber risks and data breaches their greatest concern. CyberFirst Essentials® - Small Business helps protect against the costs of failing to prevent unauthorized access to, or use of, customer identity information. Covered expenses include customer notification (often mandatory), penalties and chargebacks imposed by credit card companies, court-awarded judgments, and more. Supersize a Master Pac policy with best-in-class enhancements that deliver additional coverage features and higher limits, including sewer backup, losses resulting from damage to a power supply or overhead utility lines, increased limits for computer/data/media, and spoilage for perishable goods. Employment Practices Liability+SM (EPL+SM) EPL+ defends businesses in the event of a claim alleging a wrongful employment practice, such as discrimination or wrongful termination. EPL+ helps cover legal expenses as well as potential settlement damages, up to the coverage limit. Identity fraud expense reimbursement coverage for employees is included. Bonus: Third-party liability coverage is optional in case a patron or supplier files a discrimination claim. World Business Essentials® Extends some property and liability coverage features for periodic overseas business travel. For frequent overseas travel, or for businesses that have an overseas location, a separate Global Companion Policy is available. As the #1 provider of workers' compensation in the U.S. Travelers can help with this coverage as needed. Travelers offers physical damage and liability protection for vehicles registered to the business, including cars, delivery vans and trucks of all sizes. Up to $25M in limits over primary general liability, auto liability or employer's liability coverage. Travelers is available in all states except AK, FL, HI, LA, RI & TX. With apologies to The Marvelettes... we wanted to be sure you know that as long as you're a Big "I" member in good standing, you can take advantage of competitive shipping savings rates available from UPS. These discounts are available even if you already have a UPS account. To enroll and start saving, visit 1800members.com/IIABA or call 1-800-MEMBERS (1-800-636-2377) Monday-Friday from 8 a.m.-6 p.m.
Big "I" Markets partner Goldleaf is a national surety-only specialist. They do not retail any insurance - they deal only in surety bonds. If your insured goes to another agency for their bond needs, that agency always has an "in" for providing competitive quotes on the insurance. 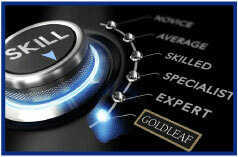 Goldleaf is your agency's "back room" bonding professional. Goldleaf can give your agency bonding expertise which otherwise may not be available allowing you to keep a long-term customer from looking elsewhere, or possibly allowing your agency to add a significant customer that you have solicited for years. Providing surety bonds can become a time-consuming, costly or even embarrassing process for independent agents. Producers and CSRs face a steep learning curve if they want to handle the product. They may not be familiar with the hundreds of different classes of bonds out there, they may not know which forms to use, may not know what information to request from the insured, and may not know which markets are the most likely to write that particular class of bonds. But they should know where to turn for help: Big "I" Markets. Goldleaf's surety specialists are experienced professionals with backgrounds in areas such as accounting, law and business finance. When other surety bond specialists or companies are restricted by size, specialty divisions, or other constraints that limit the entire bonding process, Goldleaf brings it all together under one roof. In addition, Goldleaf counsels clients to help them develop their surety program so that it grows as their business grows. Licensed in all 50 states, Goldleaf creates surety bond results for all types of companies and specific bonding requirements. They are able to leverage key surety company partnerships for an advantage that others simply do not have. Big "I" members can contact Goldleaf by logging onto www.bigimarkets.com (select the appropriate bond type from the bond options on the commercial products menu) or by calling Goldleaf directly at (888) 294-6747 (ask for Lori Olson). Wednesday, April 19 - 2:00 - 3:00pm EDT. "Big "I" Swiss Re Corporate Solutions Quarterly Risk Management Webinar". The Big "I" Professional Liability/Swiss Re Corporate Solutions quarterly risk management webinar is approaching. Agency Risk Management Essentials: Preparing for a Catastrophic Event is scheduled for April 19, 2017 at 2 P.M. Eastern and will discuss effective ways insurance agents and brokers can reduce their risk of catastrophic E&O claims. The discussion will be presented from the viewpoints of an insurance agent, a Swiss Re Claims specialist, an E&O defense counselor and a Selective Insurance Company of America representative. The session is free to Big "I" members. 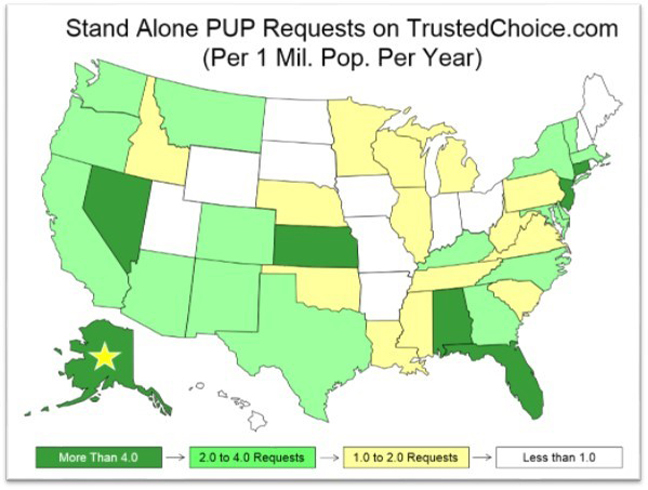 Which State Has the Most PUP Requests? Your Big I Advantage team has been working with our endorsed Personal Umbrella Policy (PUP) provider to better understand what drives PUP purchases. You may have read in these pages that RLI is also working with www.trustedchoice.com, the Web site for the Trusted Choice® brand program. RLI is driving PUP leads to agencies like yours every month. With over 40,000 agency referrals this year, we have been analyzing those that are 100%-specific PUP-only requests. We have five months of data and we are analyzing it with RLI. That data is below on our estimate of the number of PUP requests seen, on average, in each state, per year, per 1 million persons. Of course this is but one way consumers look for PUPs but the data is worth thinking about. Why the differences in rates of requests by state? This is hard to determine but we are investigating. 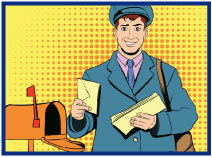 Obtaining coverage easily in some states clearly drives requests. Why the gold star for Alaska? Alaska had the most requests per person in the five-month time period. Nationally, the average number of requests was 2.5 per 1,000,000 in population and Alaska came in with the most over the test at an estimated 9.7 per million. What causes individuals to get online and start searching only for PUPs? It's hard to say for certain but the visitors to trustedchoice.com leave comments. Based on those, I would say a wide variety of coverage questions drive the searches. About half do not leave any comment but of those that do, the perfect person to answer all of them is an independent agent. You have the resources and options. Whether a standalone solution like RLI or one of your regular home and auto insurers is best, only an independent agent can match the questions. "Looking for…" and "Need a…" are common in the comments. What can you do? Make sure your website has a dedicated page focused on personal umbrellas (see this related article to learn more). Make sure you know who handles the RLI program in your state. Offer and document that you have offered your clients choices on umbrellas as all your clients would benefit from a PUP. Read more about the risk management aspect of doing so on our agency E&O risk management website, EO Happens. Congratulations to our agent in Michigan on a Performance Bond sale of $54,902 in premium!